If you’re getting married in the Land of Smiles, then why not do what Thai brides do and accessorise your wedding ensemble with a stunning selection of fine gold jewellery? Picking out the right pieces of jewellery can often present brides with just as big a challenge as selecting the right dress. As well as the shade and style of the dress, your skin tone will also come into play when it comes to determining accessories that suit. In Thailand, it’s traditional for brides to be adorned with stunning pieces of gold jewellery, from rose gold bangles and bracelets to shimmering earrings featuring elaborate settings of precious gems and pearls. If you want to take this Thai tradition and make it your own, below are a few elegant pieces that might just be perfect for your big day. Perfect for brides with a scoop, V-neck or strapless gown, this 18-karat piece from Bulgari’s exquisite collection is eye-catching to say the least. 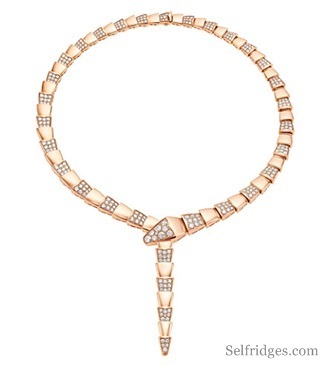 Crafted from pink gold and encrusted with pave diamonds, this necklace oozes wow factor. The elegant design aims to channel the power and dynamism of the serpent, and forms the perfect connection between Bulgari’s heritage collection and their more modern pieces. To show off such a statement piece of jewellery, consider wearing your hair in an up-do so there’s absolutely no missing the necklace. Because of its striking design sleek and simple gowns will set off this necklace perfectly, with little embellishment already sewn in. Another distinctive 18-karat rose-gold piece, this stunning necklace is from designer Shaun Leane’s luxurious collection. Pink tourmaline and white diamonds give the necklace an extra flash of colour and texture, making it another perfect piece for those brides who want to make a style statement of their own. Thanks to the scattering of previous gems, it’s also the perfect evening piece that can be worn time and time again to special events following your wedding. Taken from the label’s Aerial collection, the stunning pink and gold hues seem to be infused with a traditional Thai feel already. Many Thai brides like to incorporate plenty of bracelets as well as necklaces to establish the stunning ‘dripping in gold’ look they’ve made so distinctive. 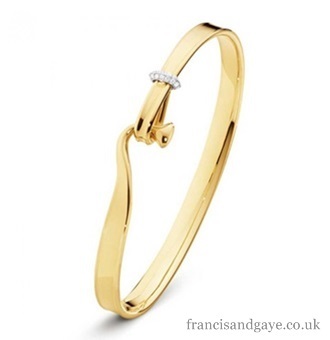 The 18-karat yellow gold and diamond bangle by Georg Jensen oozes elegance, remaining playful and chic at the same time. The unique design of the bangle is reminiscent of human hands holding on to each other, creating the idea of strength in union – the perfect piece for a wedding in particular. The diamond element adds an extra flourish of beauty, and makes it even more of a stunning keepsake item you will be able to cherish forever. 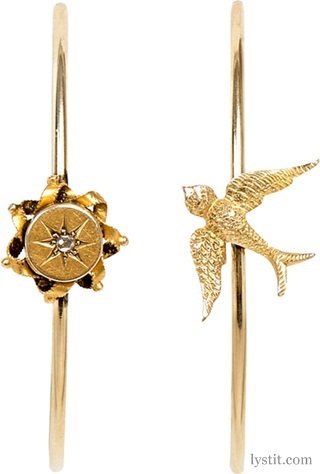 If you’re keen to follow tradition by incorporating some gold jewellery into your ensemble, while at the same time remaining a little quirky, then you’ll love these unusual earrings by London-based designer Annina Vogel. Crafted from nine-karat yellow-cut rose-gold and cut diamonds, each of the hoops features its own distinct design – one with a swallow charm and the other with a distinctive compass-like motif. These earrings gleam with a striking, antique feel and will look their best alongside an up-do or semi-up-do where the ears are on permanent display. 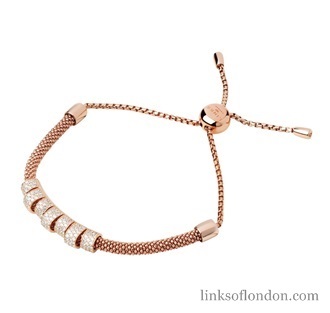 Last but certainly not least, a selection of gorgeous gold pieces would not be complete without a stunning sapphire and rose-gold bracelet by Links of London. Crafted from rich rose-gold vermeil, this statement piece boasts an elegant coronet spiral design with precious white sapphires pavé at its centre. The delicate design will suit many a beautiful bride’s wrist, and may in fact be a great idea for a surprise present for the bride on the morning of her wedding day. Both glamourous and timeless, this spectacular piece is something that will be worn again and again.